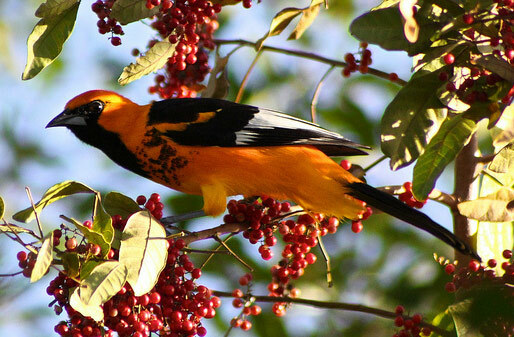 Spot-breasted Oriole: Native of Mexico; first reported in the Miami area in 1949, where it was probably introduced from escaped captives, and has since been found from Homestead to Fort Lauderdale. Preferred habitats include parks, suburbs, and gardens. Unlike most North American orioles where the males are bright and the females are dull, both sexes of the Spot-breasted Oriole are bright and look alike. This is common in tropical orioles. The Spot-breasted Oriole is a small, orange-colored bird with distinctive black face and body markings. 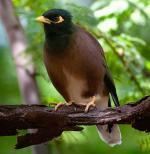 This bird is typically found in Costa Rica, El Salvador, Guatemala, Honduras, Mexico, Nicaragua and the United States. The natural habitat of the Spot-breasted Oriole includes subtropical and tropical dry forests, moist low woodlands and degraded former forests in the same climate regions. Introduced populations are also maintained in southern Florida on the Atlantic coast. Nests are built high in the trees. This species forages for its food, dining mainly on insects and seeds. The conservation rating for the Spot-breasted Oriole is Least Concern.